A growing body of evidence highlights the importance of the gut microbiota in maintaining health and healing from disease. Ayurveda, ancient holistic science of healing from India have frequently emphasized the importance of maintaining a balanced digestive fire (Agni) as the cornerstone of a healthy gut. This session will explore evidence-based research regarding the importance of diversifying the gut microbiome and its correlation to spices, incompatible food combinations and more. The time is right to analyze the connection between ancient wisdom and modern evidence to help nutrition professionals focus in providing an integrative approach to improve maintenance of gut health and well-being for patients of all ages. Discuss the concept of digestive fire (Agni) from an eastern perspective of Ayurvedic medicine. Understand the state of evidence-based research supporting the healing aspects of spices and how to effectively use them to diversify the gut microbiome of adults and children. Provide practical suggestions to nutritional professionals on how to create mindful awareness and savor meals according to the season. Apply an integrated approach with eastern wisdom and modern science in helping adult and pediatric clients establish diverse gut microbiota to strengthen the overall immune health. Sapna Punjabi-Gupta, MS, RDN, LD, is a Registered Dietitian Nutritionist, Ayurvedic Practitioner, and a Culinary Wellness Expert. She combines her Indian roots and western training to inspire and educate by emphasizing mindful eating, the healing power of food, spices, and several Ayurvedic practices as strategies to improve one’s overall health and wellbeing. She is the creative force behind her company, BeSpiced (www.bespiced.com) and conducts wellness workshops, interactive cooking classes, and also offers a line of heirloom spice products. Sapna’s YouTube Channel - Be.Spiced (https://www.youtube.com/bespiced) provides a visual access to culinary wellness combining her personal stories and recipes for a modern palate. Sapna has a Masters in Nutrition and has more than 11 years of extensive clinical expertise in the area of high risk antepartum women and critically ill premature infants. Sapna travels extensively to speak and conduct custom wellness workshops for professional groups, and for public. Sapna is the wellness advisor at the Crow Collection of Asian Art Museum in Dallas where she designs and conducts interactive wellness workshops for the public. She also authors articles for both print publications and online blogs. Sapna’s journey has been featured in the Dallas Morning News. She has been recognized as the Ayurveda Ambassador of Dallas by D Magazine in 2017. 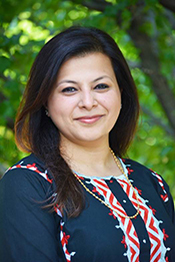 Sapna Punjabi-Gupta, MS, RDN, LD, AP, reports the following relevant disclosures: she is founder of BeSpiced/Naivedhya, LLC and is a distributor of Young Living Essential Oils. She has certified that no conflict of interest exists for this program. View our disclosure policy.